Project obstacles and solutions: AllPoints Midwest is a 1,000 acre distribution park in Avon, Indiana developed jointly by Duke Properties and Browning Investments. Building 11 is the latest of a series of large warehouses. Rescom poured all of the floors on this project. There are two critical components to the floors in this job. First, they had to be poured in large pours and quickly. Rescom required 800 yards per pour with two trucks pouring continuously. The concrete was moved into place with a power screed. Second, the floors had to be flat. In a warehouse where lifting equipment is carrying large loads, any sway in the floor could cause a safety concern. 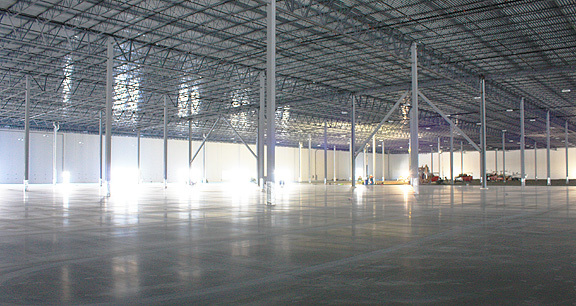 In this case, the warehouse floor included over 450,000 square feet. To meet this demand, IMI supplied a blended coarse aggregate mix that combined both large aggregates with small stone. As the concrete is placed and vibrated into place, the different sized stone work together to interlock with each other. The other part of the mix is the water-to-cement ratio. Excess water will cause plastic shrinkage and curling. IMI provided a mix with a 4 inch slump that was quickly moved and leveled with a power screed. It provided a fine finishing paste that troweled to a smooth, flat surface. IMI also provided concrete for the loading docks and semi staging areas that surrounded the building. In total, IMI supplied over 13,000 yards of concrete for this project. For more information on concrete mix designs for warehouse floors, contact the sales representative nearest you. Click here.